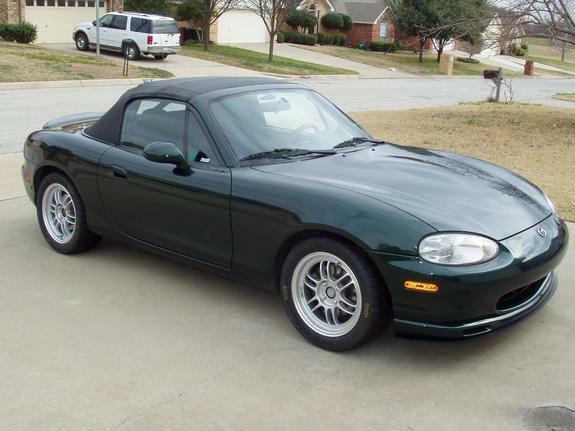 A Miata wheel should be light, and a Miata wheel should be strong...with a quality finish that lasts and lasts. This is our STRONGEST 15x7...yet thanks to rolling rim production method that results in tight grain alignment it is also our lightest 15x7 at an amazing 9.8 pounds! Includes one blue Enkei Aluminum Valve Stem! This Miata Enkei RPF1 wheel is a personal favorite for the unique combination of great quality, great finish, strength, lightness and price. Just 9.8 pounds for 15x7 size!!! Compare that to SSRs and VOLKS or any other "MADE IN JAPAN" choice with this quality and you will realize what a bargain these Enkei RPF1 Miata wheels are. Although the Kosei K1-TS and similar wheels have a similar look, don't be fooled, this Enkei RPF1 Miata wheel has a much better finish quality, and has proven MUCH stronger than regular cast wheels. Rolling Rim technology results in grain alignment similar to forged wheels costing much more. The 41mm offset puts this right in the factory Miata wheel offset range, this choice is plug and play. Note that Enkei does not make a center cap for this size but our KONIG HELIUM center caps will fit this Miata wheel if you must have center caps (remove rear spring from Helium cap, insert main disc from the cap, and spray paint the small quarter-size "Konig" label before installing). Takes a standard 73/54 hubcentric ring sold elsewhere on this website. We strongly recommend you do NOT use your factory lugs, a narrow lug will fit better and not scratch your new wheels! All our lugs are extended length for more contact with the studs and narrow to avoid scratching (see our McGard Spline Drive Lugs in particular). Does NOT fit with the factory Mazda Miata big brakes (optional in 2001-2002, standard in 2003-2005). Also does NOT fit with aftermarket Miata big brake kits. These have proven much stronger than the forged SSR wheels and yet these cost less. This is the strongest AND lightest 15 inch wheel we carry! Mazda trusts Enkei to make the factory Miata wheels, so you can trust in Enkei for the highest quality at the best price. Also fits many other 4x100 lug pattern cars including many Hondas and Toyotas, Scions, etc. Color: Silver. This is actually a must in STS solo class where people are running fast 195's size tires (205's may not be as quick). If you are going top level then expect majority of STS competitors to be on these. I experimented with a few sets of different wheels (also Kosei's), but let me tell you these feel the lightest of all and those Spec Miata regulated over 13lbs do not come close in feel (I do have some sets of Spec Miata wheels as well). No wonder that STS winners have been using them for years. They are not cheap, but they are worth the price. Also bear in mind offset 35 mm (here and in Tirerack) and 41 mm (only here) are different so do not mix them. I went 41 mm for reason.